While the Galaxy S8/S8+ are still wowing people with their high-end features and beautiful designs, attention is now turning to Samsung’s next offering: the Galaxy Note 8. Earlier reports say the device will come with elements new to the Korean company’s handsets, and the latest leak lends credence to those rumors. 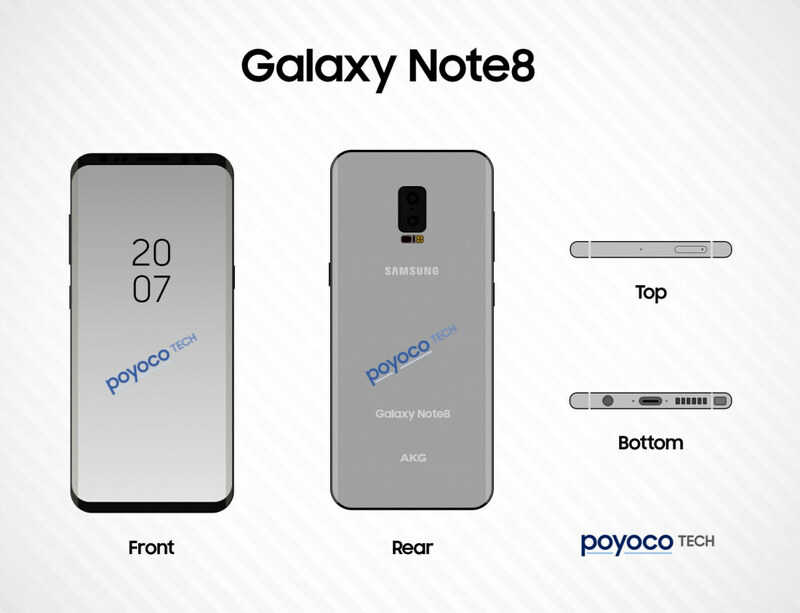 Consistent leaker Poyoco Tech has posted a series of renders showing the Note 8 looking similar to the S8 – slim bezels, infinity display – but with a few important differences. Specifically, the back of the phone has a vertical dual camera setup and lacks a fingerprint sensor. The design matches the 3D-printed Note 8 unit that YouTube channel Concept Creator made last month. Rumors that the sequel to the explosive Note 7 will be the first Samsung handset to feature a dual camera module have been around for a while, and it now looks increasingly likely. Samsung fans will no doubt cheer at the repositioning of the fingerprint sensor - its location is one of the few complaints people have about the S8. With no physical button on the front, it appears the reader will be integrated into the Note 8’s display. This had been the plan for the S8, but a last-minute problem prevented its implementation. In November last year, Samsung spent $8 billion acquiring electronics giant Harman. It appears that deal could result in some impressive acoustics for the Note 8. The logo of AKG, which is owned by Harman, appears on the back of the phone, suggesting its speakers will be tuned by the audio firm. Another Note 8 leak has shown up on Twitter, this time from “Ice universe.” It shows a more subtle improvement over the S8, but one that users will no doubt appreciate. The Infinity Display in this image comes with a smaller corner radius, meaning even more pixels could be squeezed onto the screen. The Note 8 is expected to be unveiled sometime in late August/September, possibly at Berlin’s IFA event.